The Ritz-Carlton in Amelia Island, FL – Am I Asking Too Much? I was at the Ritz-Carlton in Amelia Island, Florida, for a work conference. It’s a very traditional hotel with a beautifully manicured ground and white sand beach access. I sampled a couple of items from the room service menu, in addition to eating in their restaurant. They have five eating venues on site at the hotel. The room service food items appear to come from Cafe 4750 and Ocean Bar & Grill. 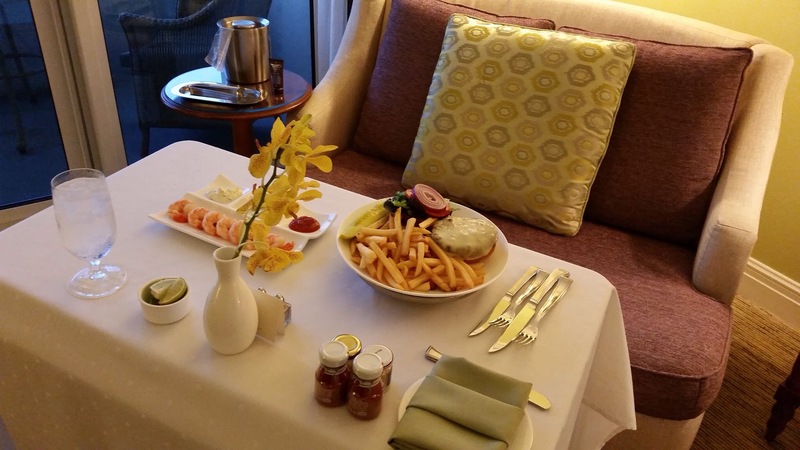 This post will focus on the room service experience since that’s the ultimate measuring stick for a hungry traveller who arrives late and tired. SHRIMP COCKTAIL: Spicy Horseradish Cocktail Sauce. BLACK ANGUS BURGER: Lettuce, Tomato, Red Onion, Fries, and Swiss. This was a cute little set up – perfect for a photo. The orchid was beautiful and probably the most tasty item on the table. The shrimp cocktail was bad. The shrimps came at near room temperature. Although I don’t have an issue with that, the texture of the shrimps was a bit limp. It was not flash frozen when caught. Low quality – similar to the frozen shrimps one can get from a generic mid-level supermarket. 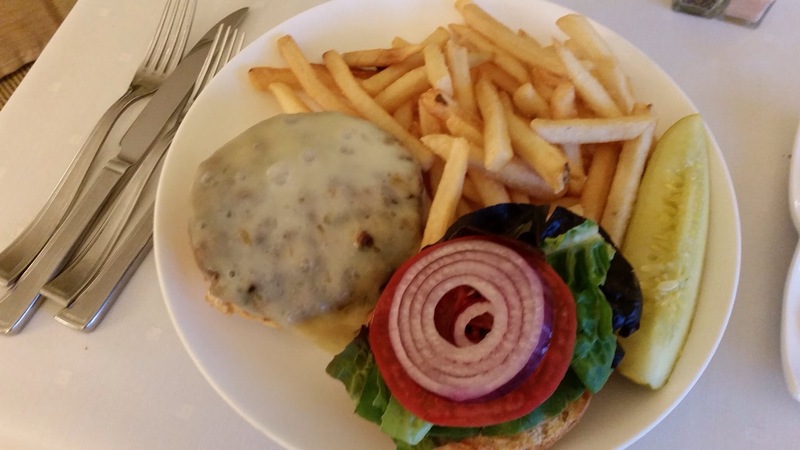 BLACK ANGUS BURGER: Lettuce, Tomato, Red Onion, Fries, and Swiss. The Ritz failed me at the shrimps but the burger was a lot better. Not medium as ordered; it was well done instead. But the burger was at least firm and tasty. However, I did slathered a ton of ketchup to make up for the dryness from over-cooking. I understand The Ritz is supposed to be a 5-star luxury hotel. The Ritz at Amelia Island is an ocean front properly with an impressive surrounding. Their restaurant, Salt, served me excellent lunch. So perhaps my standards are too high? I want freshness in seafood and the right execution for my meat. I was hungry and I ate my meal at the pretty little couch. So the meal fulfilled my basic need. Yet I was left wondering why the Ritz could not do better while enjoying the stunning ocean view outside my balcony. Posted on October 23, 2015 October 23, 2015 Categories American, Cuisines, Florida, My TravelsTags Amelia Island Florida, Amelia Island hotels, Room service the Ritz, The Ritz Restaurants, The Ritz-Carlton, The Ritz-Carlton Amelia Island1 Comment on The Ritz-Carlton in Amelia Island, FL – Am I Asking Too Much? On my way back to NY into a snowstorm day in March, my flight was delayed for a few hours. I hung out with my friend at a Starbucks until the conversation ran dry and I went into the terminal. Still had a lot of time to kill and went to the only restaurant-looking place in the terminal, Sam Snead’s Grill and Tavern. I had no idea who Sam Snead was until I walked into the restaurant. Sam Snead was an American professional golf player and had a nickname called, “Slammin’ Sammy.” I was very skeptical how a professional golf player can translate into an excellent food establishment. This is the Crab Louie Salad (somehow it’s not the restaurant menu anymore). I had very low expectations of this dish. In fact, I half expected that I could get sick from the crab and wondered what it would be like to be sick on the flight. You should have seen the restaurant – it looked like a darkened and dirtier version of the TGI Fridays with Sam’s pictures on every wall, overtired middle-aged disheveled waitresses and overweight dinners at every table chowing down something on large plates. It looked run down. Then came the salad: surprise! The crab was fresh and not from the can. The salad was fresh and the avocado had the correct ripeness. I was so wrong. I nursed this berry with vodka concoction while eating for two hours. The buzz set in and I was as happy as I was after a long run. Life was good! On the same rainy Saturday in Clearwater, Florida, eating became more important than usual to spare ourselves the boredom. My friend looked up this French Bistro, Salt N Pepper, and thought we could just show up and be seated for an early dinner. For two women from NYC, we thought little of the local demand. We were left out in the rain and got diverted to the next best thing down the street – Cristinos Coal Oven Pizza on South Fort Harrison Ave.
Cirstinos was busy. The parking lot was packed and people were standing outside waiting to get in. Luckily, they had a table for us quickly. If you think of a slightly larger pizza joint in an upscale town in Westchester, you will have Cristinos. The place was buzzing with customers, the ovens were hot, and the decor was outdated. A mom and pop shop for sure. But obviously, it is also a local favorite observed by how packed the dinning room was. Garlic Shrimp: Fresh shrimp sautéed in a white wine garlic sauce. Margherita with Prosciutto – Tomato sauce, fresh mozzarella, fresh basil, oregano. Quattro Formaggi with Sausage Tomato sauce, mozzarella, goat cheese, ricotta, gorgonzola, basil and oregano. Bad combo. Ricotta was a very bad addition as one of the cheeses. Trader Joe’s frozen Quattro Formaggi is better. The toughest decision for me was to decide whether I should have the sausage or pepperoni with the four cheese pie. If I were to get a regular pizza from a pizzeria, Cristinos would have been acceptable. But as a restaurant, this is way below par when compared to Fortina’s in Armonk. It was certainly a let down from the French Bistro food to pizzeria pizza. I was just happy that we were fed and sheltered from the rain. Pretty low standards. Here is to a sunny Sunday! Buon appetito! I went to Clearwater, Florida, for a short weekend at the end of February to recharge, get some sun, and be away from the storming weather of the NorthEast. As life would have it, it poured the entire day on Saturday. My friend and I tried to salvage the day by eating at the Wildflower Cafe on Fort Harrison Ave. Wildflower was a well-rated restaurant that serves daily breakfast and brunch. It was also extremely busy when we got there. People were running to get inside the restaurant. We knew the food would be good, but we were in for a huge surprise. Cheesy Grits & Scramble Eggs. The grits came separately. Can you see the buttermilk biscuit in the photo? Honestly, the eggs were ok and the sausage was average. But the biscuit was outstanding. It was very crumbly which I don’t usually like. I also don’t usually like biscuits. But this one… The balance between the butter, the sweet and the salty was just right. Even if it is crumbly, I wanted more with each bite. This is another example of ugly but awesome tasting food. Definitely go back for the biscuits. I would be willing to eat the other items on the plate because of the biscuits. It was a sufficient temporary distraction for us from the rain. My friend and I stayed at the Clearwater Beach Marriott Suites on Sand Key in Clearwater, Florida. After our dinner at St. Petersburg, we came back to the hotel and decided to have dessert. The lobby of the hotel has the Watercolor Lounge which faces the Clearwater Bay. The view was beautiful in the day light when the sun hits the water just right. At night, you see flickers of light from the boats on the bay. We sat in the lobby and ordered two desserts. Mini – Indulgences Crème Brûlée with fresh strawberries, whip cream. Aren’t they cute? The presentation was adorable. The taste was okay. Not creamy enough and too much whipped cream. The fruit on top did not give it enough distinction between each spoonful. Krispy Kreme® Bread Pudding with vanilla bean ice cream. This was awesome. Didn’t think I would like a donut bread pudding dessert since I rarely eat donuts and am generally not a bread pudding fan. The chocolate they laced on top of the bread pudding was heavenly. The fried and sweet blended well. The ice cream provided a nice cooling sensation from the pudding. It was a very happy ending to the night and to my first day in Clearwater. It is always nice to end the night with sweets and great conversations. Good night, everyone. Roasted Red Curry Chicken Spring Rolls: Cucumber kimchi, peppadew coulis, cilantro-jalapeno puree, scallion. Anything would taste good when you are starving. But I believe this was more than hungry satisfaction. The spring rolls were not greasy but crisp. The jalapeno puree, peppadew coulis and the kimchi cucumber combination made me lick up all the sauce on the plate. Chicken Fried Calamari: Carrot puree, pickled okra, thyme scented honey, bourbon smoked peppercorn gravy, house made hot sauce. The Birchwood Cobb: McGregors’ hydroponic romaine, duck confit, grape tomato, crisp pork belly, gorgonzola fritter, avocado, chopped duck egg, preserved lemon & fine herb dressing. Best part of this is the duck confit and then the gorgonzola fritter. When you bite into the fritter, the explosion takes you by surprise. Never knew gorgonzola would taste not so stinky. This is one of the more sophisticated Cobbs out there. Dragon-Berry Mojito: Bacardi dragon-berry rum muddled with fresh berries, mint, and lime, a splash of house made simple syrup, topped with soda. We ordered this mojito virgin. mmm. mmm. Birch and Vine knows their cocktails. Highly recommend this establishment. Next time, I should order the mojito with the Bacardi rum.